Flyer of the Symposium at LAI/FU. 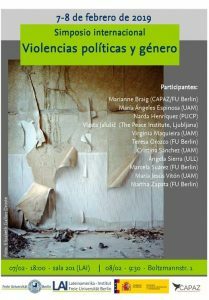 The CAPAZ Institute and the Institute for Latin American Studies (LAI) at Freie Universität Berlin (FU) invite to the International Symposium on political violences and gender, which will take place on 7 and 8 February 2019 in Berlin, Germany. Researchers working at LAI, universities in Peru and Spain, and the Institute for Peace Studies in Ljubljana, Slovenia, will participate in this event. Researchers Cristina Sánchez (Universidad Autónoma de Madrid) and Teresa Orozco (LAI/FU Berlin) coordinate the organisation. The symposium is also organised in cooperation with the project “Political violence and gender: imaginaries, scenarios and strategies”, based at Universidad Autónoma de Madrid. Download the Symposium’s programme (in Spanish).